As the warmer temperatures begin to roll in, there is no thought more prevalent than the beginning of spring cleaning. Spring is a time when all the forgotten places of winter begin to come to light, and there is nothing more refreshing than refreshing your home. A major topic these days is how to involve your kids in spring cleaning, especially in a way that is fun and engaging for them. The hope is to get your kids involved and wanting to help clean, not only to teach them the value of hard work, and the importance of cleaning up after themselves, but to get you an extra pair of hands (or two) to get this project done faster. What then, are some of the best ways to get your kids involved in this years’ spring cleaning? Make sure tasks are age appropriate – Make it a game! Obviously, the tasks that you can involve your kids in does depend on their age and ability, however there are so many ways to make cleaning fun and get kids of any age involved in the process. To begin with – pump up the music. Getting some good tunes playing and letting cleaning be combined with a motivating dance party is the first step in making cleaning fun with your kids. Turn a boring chore into an easy task with great music playing. With younger kids, you can turn the music into a game, such as “wax museum”, having your kids freeze in place when the music stops. This is not only a fun challenge for them, but also a simple test of balance and coordination too! Making cleaning into a variety of games can help motivate your kids and get cleaning done faster. There are so many different games that can be played while cleaning, such as the karate kid way to clean windows/mirrors/cars to test your kids stamina, coordination, and ability to follow directions. Older children can be given more challenging tasks such as alphabetizing the spice drawer or playing “expiration date detective” with cleaning out the refrigerator. Organization is key when it comes to cleaning and putting things away. Making sure that your home is organized, and things have their own place. This can help your children learn where to put their toys when tidying up. Creating games like “scavenger hunt” when it comes to toy box clean up can help motivate younger children. Another great idea is to give your children their own tools/cleaning supplies for the tasks they need to complete. This gives them a bigger sense of responsibility, and also means they won’t be interrupting your cleaning looking for supplies. Remember to start small. You can’t overhaul your entire house in one day, especially when you have children running around. Setting aside time each day or on the weekend and breaking your spring cleaning into smaller tasks such as going through toy boxes and closets one day, and cleaning windows the next, can help make spring cleaning feeling more manageable for you, and more fun for your kids. No one likes spending an entire day doing chores! Planning ahead and ensuring that your family knows when you will all be cleaning is important, especially when you have older children. Knowing that they are needed at home for that day ensures that they don’t’ make plans to be out. Offer a fun ending to the day, such as going out for ice cream as a family. Cleaning with your kids helps them to learn their responsibility when it comes to tidying up after themselves. Allowing older children to choose their own tasks increases this sense of responsibility and having “rewards” can be motivating. The rewards could be monetary (and adjusted for the age of your children) or it could be a points-related game in which your kids earn points for tasks completed. Remember that team work makes dream work, and partnering up your younger children with a parent, or older sibling can help ensure that they feel confident in their new responsibilities, and the task is completed efficiently. Lastly, involve your children in the bigger picture when it comes to spring cleaning. As you go through your home (closets, toys etc.) involve your kids in setting aside toys that are to be donated. Have them come with you when you make the donations and allow them to be involved in the sorting process. Focus on acquiring less, and using more of what you already have. Spring cleaning doesn’t have to be an undesirable chore. 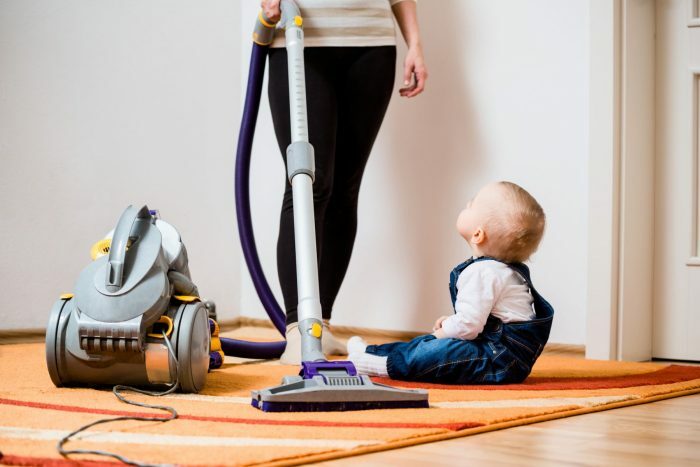 By involving your kids, and creating fun cleaning games and races they can do, you can help them learn the importance of cleaning and their responsibility, all while accomplishing your seasonal tasks!